They say food is love. If that is true, then the brand of love I want to cultivate is best represented by slow food, the sort that sits at a lazy simmer for hours, or rises gently into a yeasty pillow of dough. It speaks of comfort, patience and effort. Not to say that quick-fix meals aren’t an equally expression of love or nurture in their own way—most nights that is all I can personally manage, and I know my family appreciates a 30-minute meal just as much as one I slaved over all day. But special occasions deserve special meals, so I spent most of the day yesterday working on one. Since we can’t afford to eat out much anymore, I decided to make something we haven’t had for a good long while: cannelloni, with fresh pasta and homemade ragu bolognese. It was delicious. Using Marcella Hazan’s recipes, it took like 7 hours to make, most of which was fortunately just simmering time for the ragu. I had some boneless pork shoulder meat leftover from making Hawaiian braised pork last week, so I ground that up and added it to the sauce. 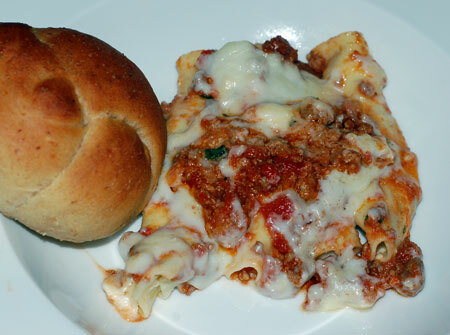 I slightly adapted Marcella’s cannelloni filling to use spinach rather than more meat, and rolled up the noodles jelly-roll style as she recommended. Doesn’t make the most lovely photograph, but hopefully Jeremy thought it was worth the effort (and the time he spent watching Nolan while I worked). I only made a few slight adjustments to this recipe out of necessity. I had to use quite a bit more flour than called for, probably as much as 2 cups, because the dough was much too sticky to work with. I also made a substitution for the buttermilk that seemed to work out perfectly—a 50/50 mix of 2% milk and lowfat plain yogurt, mixed together. 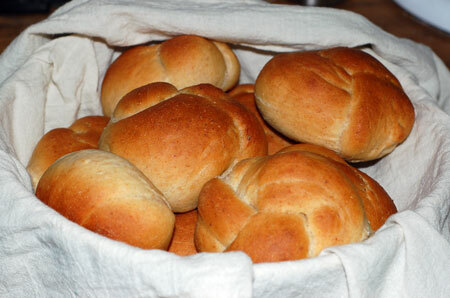 I made my rolls into little “love knots” for a little interest, and baked them at 400F for 12 or 13 minutes. The loaf went in at 385F as called for, but came out again after only 40 minutes with a much darker top than I would have liked. Next time I would start temping it after 30 minutes or so. Set aside 1/4 C oats for topping bread. Place the remaining 1 1/4 C oats in a small bowl and cover with the boiling water. 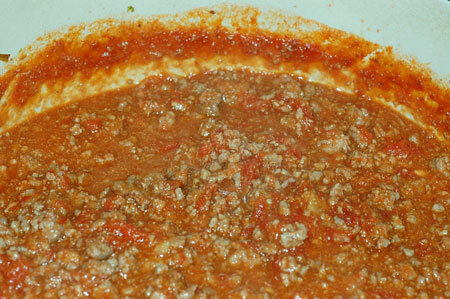 Mix together and allow to soak uncovered until the water is absorbed, about 10 minutes. Place warm water and yeast in the bowl of your stand mixer and stir to combine. Allow to proof for 5 minutes, then add soaked oats, buttermilk, oil, brown sugar, salt, and both flours. Use the hook attachment of your stand mixer to knead the dough for about 10 minutes, or until the dough becomes less wet and forms a satiny ball that bounces back quickly when pressed. Place dough in an oiled bowl and cover with plastic wrap. Proof in a warm place for about an hour, or until the dough has almost doubled in size. Pull dough out of the bowl and shape in a 9×5 loaf pan. Cover with plastic wrap and allow to proof again for about 45 minutes. 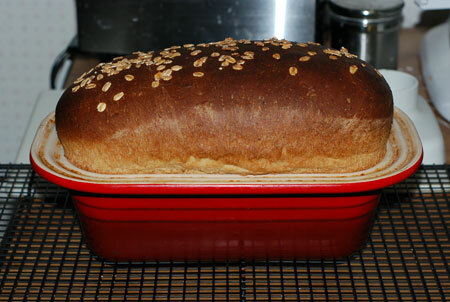 Spray the top of the loaf with a light coat of water and sprinkle with reserved oats. Bake in a preheated 385F oven for about an hour, until the top is a deep golden brown, and the internal temperature is about 195F. Allow to rest in the pan on a rack for 30 minutes, before removing from the pan to cool completely. Source: Macrina Bakery & Cafe Cookbook by Leslie Mackie.